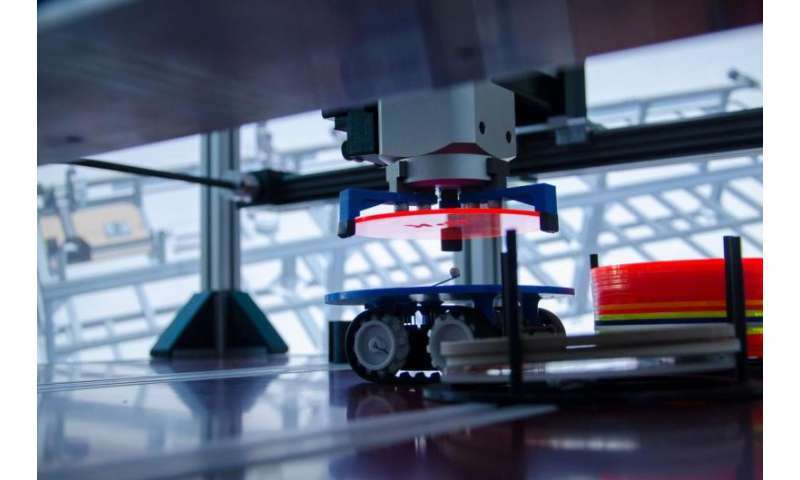 With an innovative new concept, researchers of the Fraunhofer Institute for Production Systems and Design Technology IPK want to turn the vision of Industrie 4.0 into reality. A digital twin models the entire production process and permits direct intervention into manufacturing at all times. Real and virtual production merge into an intelligent overall system. Efficient production control is a key industrial technology. So at first, the notion of building up two parallel factories instead of one may sound like nothing but doubling of effort. But what if one of the factories existed only in virtual form? This is the basic idea behind an innovative concept from the Fraunhofer Institute for Production Systems and Design Technology IPK in Berlin. The real factory is fully modeled at the digital level, creating a virtual twin that not only visualizes the production system with all its machines, but also reproduces the dynamic processes and the behavior of system components during production in real time. In the virtual twin, it is possible to observe the manufacturing process in detail. Numerous sensors continuously feed the operating status of the individual workstations to the system. This opens up new possibilities for production control. Production planners can analyze the manufacturing process in the virtual simulation and then optimize or reorganize individual steps as required. However, the concept of the digital twin goes far beyond mere simulation of the real production system. The system is actually bidirectional. At the virtual level, you can intervene and make changes, which can be simulated immediately. Conversely, you can load changes in the real system into the digital twin. For instance, a production manager may activate additional machines to process a workpiece or incorporate an additional work step when a custom build is required. To do this, production does not have to be stopped and reconfigured, but the system reacts intelligently to every change and reorganizes itself. The merging of real and digital production creates an overall system that monitors, controls and corrects itself while production is running. Whenever required, machines and software communicate with each other autonomously and keep production moving. If, for example, a fault arises – such as the failure of a subsystem – the system can decide independently how to resolve the problem. The supervising manager sees the change in production, but does not have to intervene. Moreover, because the system feeds the digital twin continuously with data, it is possible to permanently control the quality of workpieces and the end product. 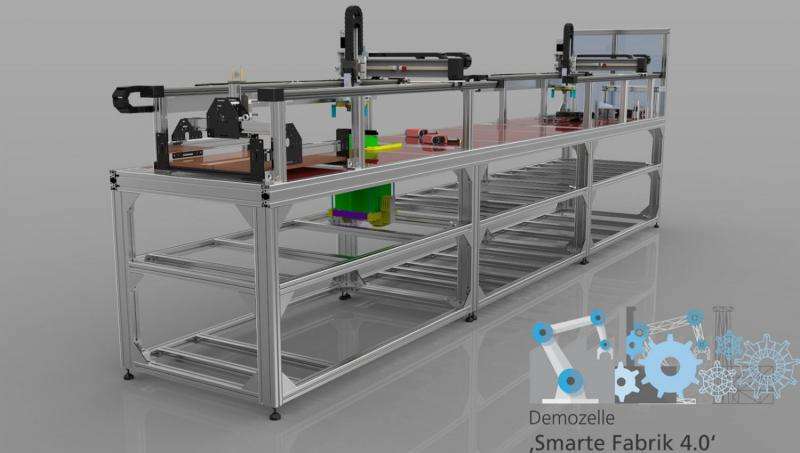 The concept can also be used to quickly manufacture small-scale series with individualized parts in such a way as to cause minimal disruption to overall production. Even the manufacture of individual pieces (batch sizes of one) is conceivable through the use of product models for the generation of production models (e.g. NC code). structing the production system. Before the first actual workpiece is processed, factories can simulate the production flow in advance, identify weaknesses and optimize processes. In this way, the system is virtually put into operation and tested ahead of actual production. This speeds up planning and makes it easier to commission a new production system. Consequently, the Fraunhofer project supplies a practical example of how the Industrie 4.0 megatrend can work. "Our goal is not only to describe key Industrie 4.0 technologies, processes and methods, but to really make them tangible," says Professor Dr.-Ing. Rainer Stark, project manager at Fraunhofer IPK. Together with industrial partners, the Fraunhofer expert and his team want to develop initial pilot projects to market-readiness in the near future. To be able to make the ambitious concept a reality, the Fraunhofer experts had to overcome a series of technical challenges. Many of the techniques and applications for the digital twin were not yet available, which meant that the researchers had to develop them. "We want to do without proprietary components entirely and for all interfaces to be 100% compatible with industrial standards," explains Stark. "At the same time, the system must not become too expensive. After all, the company should be able to recoup its investment quickly." The sensor technology used is one of the engineering highlights. The Fraunhofer researchers use a combination of physical and virtual sensors, whereby the virtual sensors process the measurement data into complex reports about the status of the system. A key technical element is the data transmission, which has a hybrid design for transferring data within the production facility and to the control center. That is to say, it uses classic wireless data standards such as WLAN and LTE and also industrial standards such as EtherCAT. The technology can be scaled as required. It is capable of controlling individual systems, but could also monitor a whole factory. Computing power and network capacities are the only limits, although the work and effort required for modeling and the fidelity to detail or granularity of the digital twin are also restrictions of sorts. After that, there only remains the issue of security, which the engineers carefully considered in their planning. The whole system moves inside its own separate internal network, which is protected by a firewall and the strictly controlled authorization of individual ports. Fraunhofer IPK will be demonstrating how the system works on February 9 at the Hannover Messe Preview, and from April 24-28 at the Hannover Messe (Hall 17). The demonstration features a production system for manufacturing beverage coasters, which are each produced on an individualized basis.